АЯ Волонтер: Улыбнись в Индии! Индийская организация SMILE предлагает участие в своих LTV (долгосрочных) проектах c разными типами тематик и деятельности: обучение английскому языку, социальная работа, строительство/реконструкция, искусство и ремесло, забота о здоровье. Types of work: Teaching English [ TE], Social Work [SW, washing /cleaning/food distribution etc], Construction/ Reconstruction [ Cons], Art and Craft [AC], Health Care [HC]. Food: 3 time’s local vegetarian food available. Supports included in the living cost: 3 times vegetarian food, shared simple dormitory type of accommodation in hotel/school building/community house/host family/hostel, etc. as per available and organized by the local service provider on your arrival. Supports excluded of living cost: air ticket, entry fees, visa cost, insurances cost, medical cost, personal expenditures (gifts, drinking water, soft drinks, any special food, transportation) and any other expenses which are not mentioned as included in the living cost. Living cost: Euro 70/ week/ head ,applicable for volunteers participating from our partner organizations(CCIVS) only. Applicants are requested to pay their living cost at a time to the local service providers / host family representative on their arrival in Indian currency only . This living cost is non refundable and non transferable in any case. Any volunteer participating for a single day also required to pay the full living cost to our service provide. All volunteers are requested to arrive on the first day of the project on time as per the infosheet . B. 2 copies of your recent photograph. a) Responsibility to keep rules of SMILE & its partners to run the Work Camp. b) Respect local cultures, dress codes, tradition. c) Open and flexible with the local food, accommodation set up, systems, etc. Short description: Sealdah is the main rail station of Kolkata (one of the old city in India) where nearly 300 street children live with or without their family. Lack of food, education, medical facilities are the root of all problem .People are involved in different illegal activities due to the lack of job availabilities. Since 2003 SMILE’s target is to help these kids throughout the year. Every Volunteer can get a chance to see and work with the neediest part of the country. You can always find yourself really important in this place. Only your love and affection can give these kids a chance to lead their life and stand on their own feet. Every Monday to Friday we provide different types of welfare service (eg: washing, cleaning, food distribution, medical service, teaching, etc.) and we need your hands in this mission. Afternoon time volunteers are requested to prepare the lessons plan for the next day. Short description: Madhyamgram is located 20 km from the centre Kolkata. It is a peaceful village with electricity, internet and good transportation facilities. Most of the people living there belong to the poor & middle class families. SMILE has its first non formal school set up under Happy Home project for the needy kids from the local slums . Most of the kids coming at this school are from refugee families. SMILE needs volunteers who can teach these kids basic English, art & craft, music, drama, yoga, etc. Volunteers of all age are welcome to this project. Afternoon time volunteers are requested to prepare the lessons plan for the next day. Short description: Bishorpara is located 13 km from the centre Kolkata. Most of the people living there belong to the poor families. SMILE has its non formal school set up under Happy Home project for the needy kids from the local slums . Most of the kids coming at this school are from refugee families. 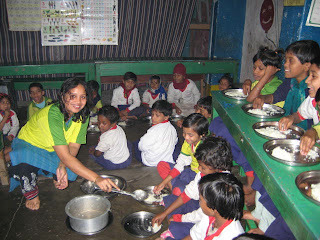 SMILE needs volunteers who can teach these kids basic English, art &craft, music, drama, yoga, etc. Volunteers of all age are welcome at this project. Afternoon time volunteers are requested to prepare the lessons plan for the next day.